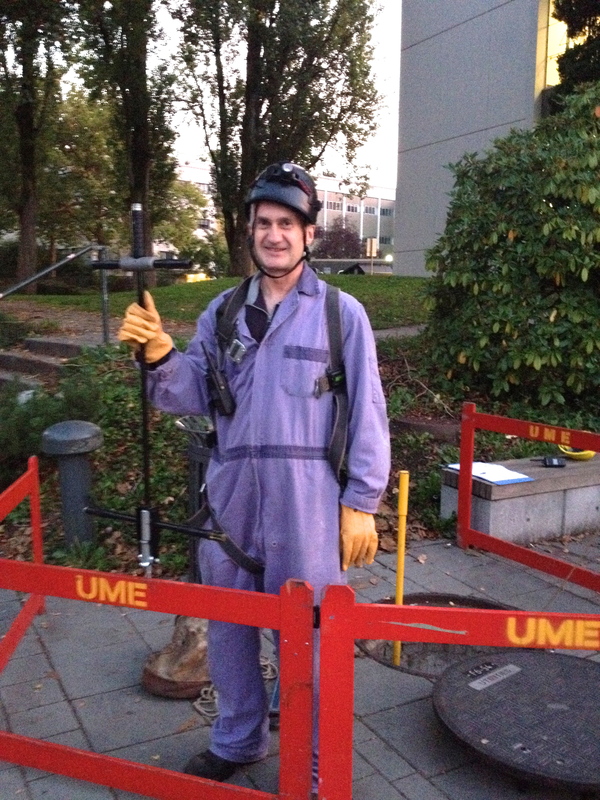 Today, as I was walking along UBC’s campus, I made eye contact with a man in a purple jumpsuit and a helmet. He seemed to be working on a construction project of some kind, and I was interested in learning more about what he was doing and who he was. So I switched directions and went to say “hi”. I asked him what he was up to and he said he was working on the steam tunnels. “Want to see?” he asked. He opened the fence that stood between us so that I could get a closer look. I peered down into the tunnel and saw the ladder and pathway that lay below. His name is Francis and he is a steam engineer. He’s also my stranger of the day. When I told him about my project and that I wanted to learn more about his story, he stared at me and said: “really?” He was surprised but willing. He stepped outside the fence to chat with me, in perhaps not just a literal sense. I’m glad he did. This evening, he’s working overtime. He was smiling and seemed to get along with his co-workers, too. Francis told me about how he used to work in UBC’s Bioenergy Research and Demonstration Facility. There, he explained, they use wood waste to produce energy and heat, conserving natural gas in the process. Francis told me about how students try to break into the tunnel pathways. They think it’s funny, but it’s actually really dangerous. The heat could kill a person walking around aimlessly. Now, they cover the tunnels with locks. I asked him about what he likes to do in his free time. I learned that he enjoys playing the sitar. He’s also been spending quite some time learning how to speak mandarin. He’s traveled to China a few times, and felt compelled to learn the language. Although our interaction was fairly brief, I can tell that Francis is a very thoughtful, conscientious, and respectful individual. He is a man of few words and is a great listener. From learning about his hobbies alone, it’s evident that he enjoys learning about other cultures. And whenever I would ask him a question, he would ask me one back. He even caught me off guard, asking me, in return, what my life advice would be. When we parted ways, he took off his glove to shake my hand. I’m glad we met.